First responders are trained how to use grain bin rescue tubes during a Rural Family Safety Day. Steve Brunner always has safety on his mind whether it’s in his capacity as a maintenance electrician, farmer or captain of the Stockdale Volunteer Fire Department. This summer Pike County Farm Bureau helped him and other residents by partially funding two grain bin rescue tubes and sponsoring training for first responders on the equipment as well as a safety awareness day for residents. The rescue tubes are the first in the county and were funded by the county Farm Bureau and Wilber-Price Insurance Group. 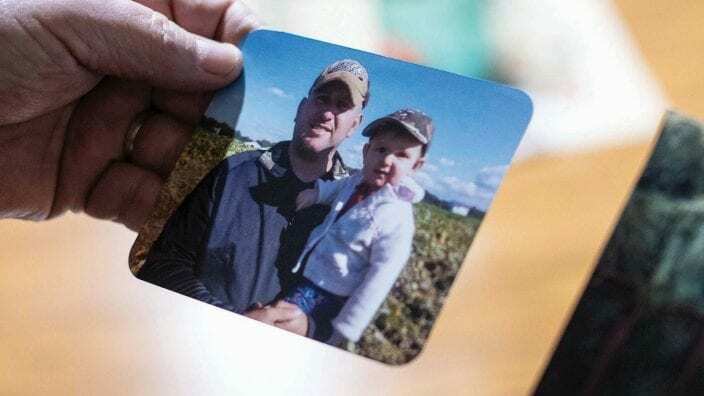 “Our area has a lot of small grain bins and it’s always been in the back of my mind that if we needed a rescue tube, the closest one is in Hillsboro and that’s 50 miles away and would be too late. We provided close to $5,000 worth of equipment to county fire departments that did not have a dime to them,” said Brunner, Pike County Farm Bureau’s president, noting that rescue tubes went to both the Stockdale and Waverly volunteer fire departments. To help the community become more aware of safety issues, the county Farm Bureau partnered with Wilber-Price, Ohio State University Extension, the local sheriff’s department, Soil and Water Conservation District and fire departments for a Rural Family Safety Day. Residents learned about safety topics related to their food, ATVs, animals and the sun, and the sheriff’s department handed out information about its Post Overdose Response Team program. Even Smokey Bear was on hand to promote fire safety. 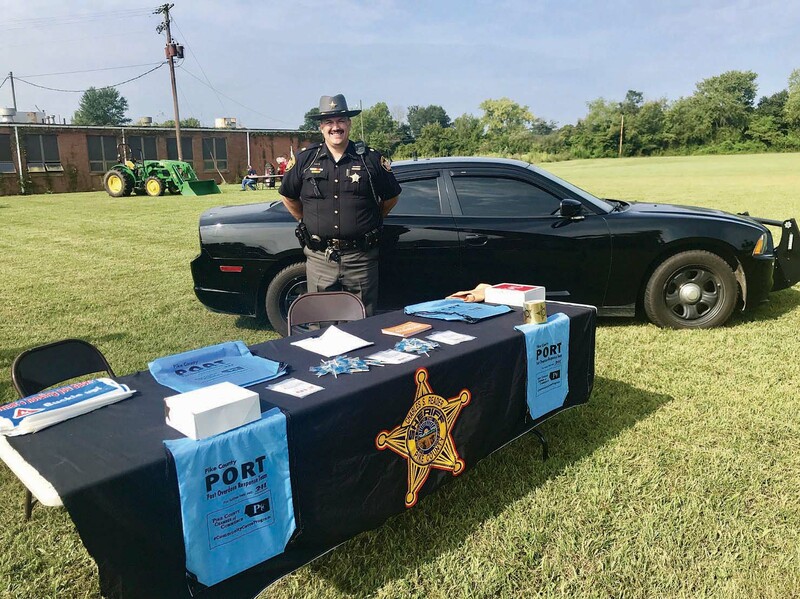 The Pike County Sheriff’s department handed out information about its Post Overdose Response Team during the Rural Family Safety Day. The two-day event, which received an Ohio Farm Bureau Foundation grant, was one of seven county programs in Ohio to receive American Farm Bureau’s County Activities of Excellence Award for unique, local and volunteer-driven programming. That’s quite the distinction considering only 24 programs nationwide received the award. Last year Ohio Farm Bureau provided $1.13 million to support more than 400 county programs. These programs statewide had a direct and positive impact on communities, informing students about high-demand agricultural careers, researching ways to improve soil health and water quality and raising $10,000 for Ross County’s Drug Free Clubs of America program, also known as M.A.D.E. (My Attitude Determines Everything). 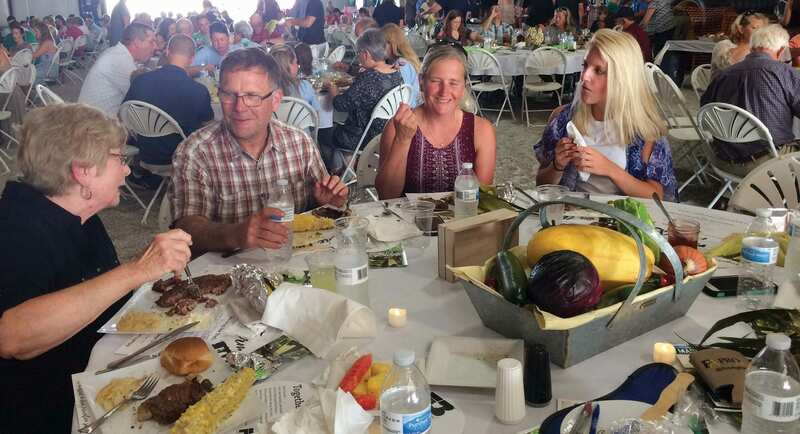 The fundraiser was held on a Farm Bureau member’s farm and included a live and silent auction. Drug Free Clubs of America program, also known as M.A.D.E. (My Attitude Determines Everything) in Ross County. The county Farm Bureau has been working on raising funds for a permanent grain bin and grain leg safety training site that would be accessible to both first responders and outside groups from a six-state area. The program provided a well-rounded education about farm safety to three age levels. The counties encouraged elementary students to learn about farm safety by using a county designed AgMag. Volunteers spoke to high school students and reached out to local farmers to post Caution Farm Equipment signs on roadways that experience large farm equipment traffic. Dozens of students, teachers and school counselors learned about the wide variety of agricultural careers by visiting local food, leather and tractor companies as well as Ohio State University’s Agricultural Technical Institute. The “Tailgate to Touchdowns” event at the football stadium promoted agriculture and the school’s new horticulture and FFA chapter. A fiberglass milking cow, coloring tables, straw bale maze, games and interactive displays were part of a play space created at the Coshocton County Fair to entertain and teach children about agriculture. 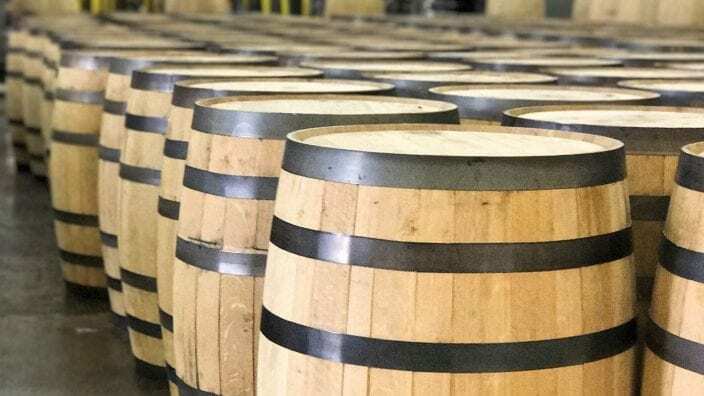 The project was one of 10 nationwide to receive a $1,000 mini-grant from the American Farm Bureau Foundation. Area chefs participated in a fun competition to showcase their recipe development skills and cooking abilities using food grown and produced locally. The event raised $8,500 for a community center that serves dinner for the needy as well as distributes hygiene products. More than 3,500 elementary students learned the science, history and health benefits of eating corn over a two-week period and each school meal featured a different corn food and fact about the crop. Six students were invited to take a combine ride with a local farmer so they could see the crop out in the field. A barn that dates back to the early 1800s and is still used for farming today was painted to commemorate Ohio Farm Bureau’s 100th anniversary this year. The barn, owned by the Adams family, appeared on the cover of the January/February edition of Our Ohio magazine. Live video allowed students and farmers to interact directly without leaving the classroom or farm. The virtual field trips gave students access to biosecure barns. A partnership was created between the county Farm Bureau and community college to develop programs that complement each other. For example, Farm Bureau worked with the college’s Culinary Arts program to source local farms to provide products for the student-run restaurant. The students then took field trips to each of the farms to learn about how the products are grown and how much work it takes to get the ingredients to their kitchen. The goal of this project was to research ways to improve soil health and water quality in the watershed. Data was collected for 16 months on the difference in soil health between a long-term, no-till system and a minimum till system and then shared with the public at a field day event. Seventh and eighth grade students attended monthly after school classes to get a better understanding of the agriculture industry and the many career options. Topics they explored included animal management, horticulture and gardening, wildlife and natural resources and food safety. Fourteen different safety sessions were offered on lawn mower safety, tractor and power-take-off safety, ATV safety, fall protection, drug and alcohol awareness, grain bin safety, dangers of working with livestock, sun protection, canine search and rescue, derma-skin cancer screening, livestock hauling, family fire safety and chainsaw safety. Two grain bin rescue tubes were presented to the fire departments and a mock farm accident was conducted. Fourth grade students from two counties attended this educational event at the Eastern Ohio Resource Development Center in Caldwell. Farm Bureau presented a program on corn for all 800 students. A popcorn popper was set up and students tasted samples as they learned about the varieties of corn and its many uses. American Farm Bureau’s AgMag on corn was distributed to the students. Third grade students from every school in the county visited a local farm where they rotated among safety stations, including gun safety, water safety, grain entrapment, poison and chemical safety, equipment entanglement, lawn mowers and electricity. A mock ATV accident included an actual 911 call-in and life flight helicopter landing on the property. More than 250 people attended a fundraiser on a Farm Bureau member’s farm to raise raise money for the county Drug Free Clubs of America program, also known as the M.A.D.E. program (My Attitude Determines Everything). The event, which included a live and silent auction, raised $10,000. Scioto: Conservation School … Is Cool! More than 150 people attended this hands-on education event where they learned about topics such as timber management and harvest, invasive weed management, basic beekeeping, urban wildlife, backyard bluebirds and keeping chickens. County Farm Bureau volunteers worked together with local AgCredit and Farm Service Agency agents to develop a program that highlighted loans specific to new and beginning farmers. The event attracted 115 people. The county Farm Bureau has been a strong supporter of the Ag Pavilion and Food Stand, including helping raise funds for a new building three years ago. This year the food stand, often staffed by Farm Bureau volunteers, raised $20,000, which was used for scholarships and the purchase of several animals at the livestock sale. The meat was donated to local food banks. During this event, a greenhouse owner explained the tools needed to grow a successful herb garden. Guests also learned from a mixologist who demonstrated how to use herbs in cocktails, and they took potted herbs home. 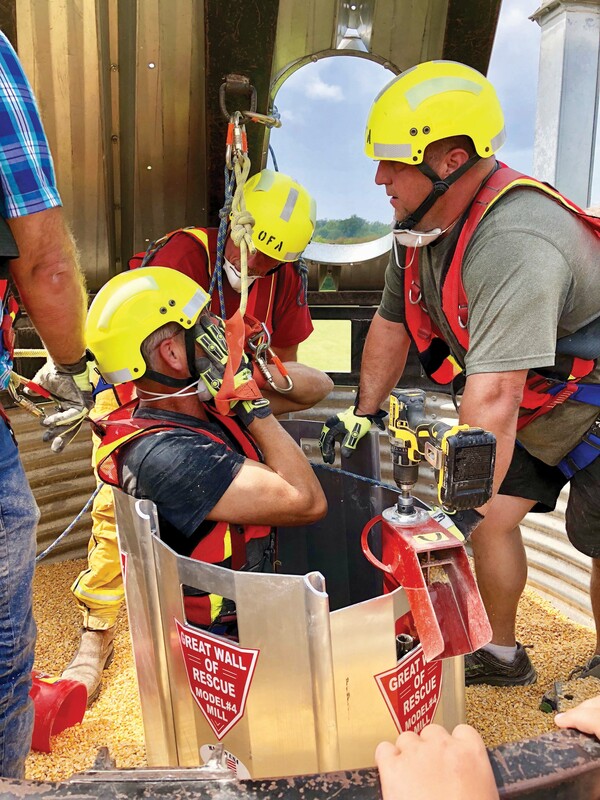 Featured Image: Pike County received its first grain bin rescue tubes thanks to funding from Pike County Farm Bureau and Wilber-Price Insurance Group.